Once upon a time, I was a high school sophomore and our youth group took a church history trip from Missouri to Tennessee to explore our Cumberland Presbyterian tradition. 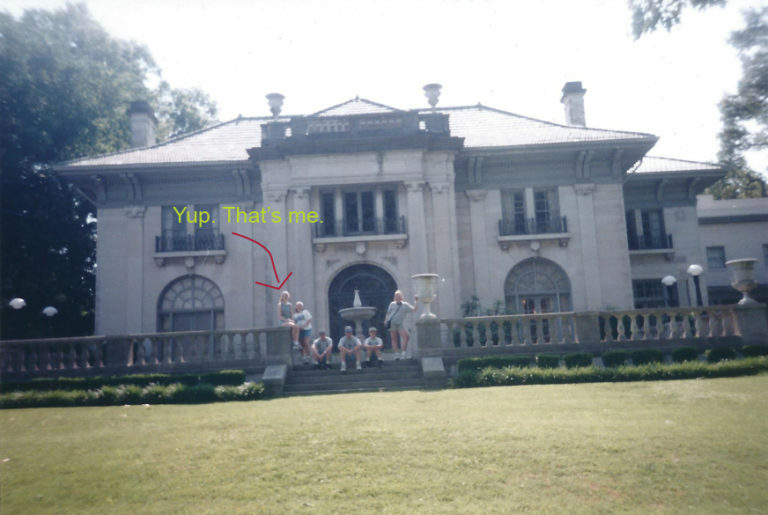 Who knew that 15-16 years later, I’d be attending classes in this same mansion at Memphis Theological Seminary? It’s the mid point once again in this semester’s journey at Memphis Theological Seminary. I’m still here to blog about it. I’m taking four classes this fall, totaling 10.5 hours. For the most part, I’m really enjoying the classes once again. The most unusual is a class the seminary makes every new student take. I’m a part of a class called Formation of Ministry, which is a very small class (four students, two leaders) that teaches its students how to apply spiritual disciplines to one’s life, while also reflecting on the practice of instituting those disciplines into one’s life. The joke is that it is group therapy for preachers in training. It’s a very holy hour and a half of my life each week that’s caused me to seriously consider some disciplines and reactions to situations in my life on a more Christ-centered level. We also are assigned covenant partners, and I’ve really enjoyed getting to know my Dee each week through dinners in between classes! My other favorite class is one I was extremely nervous about going in to the semester: Christian Ethics. It’s been amazingly stimulating both spiritually and academically to consider some of the methodology behind engaging in ethical decisions and opinions we undertake as Christians. My professor, Dr. Pete Gathje, is one of the best I’ve encountered in my post-secondary education process, and so far, he’s been extremely patient with my need to ask questions at every turn. 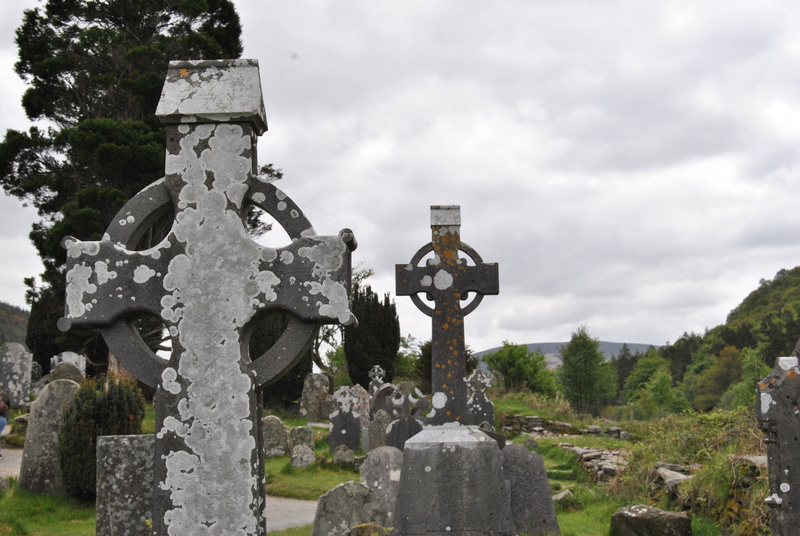 Christian Heritage has also been very stimulating as it combines Christian beliefs with Christian history. My knowledge of history has always been lacking, but right now I find myself hungering to understand the origins and evolution of the Christian faith. It has certainly rewarded me in that endeavor. I also have an online class, Leadership Formation of Adolescents, which unfortunately I have not found as stimulating. But there’s still another eight weeks to hope for better. 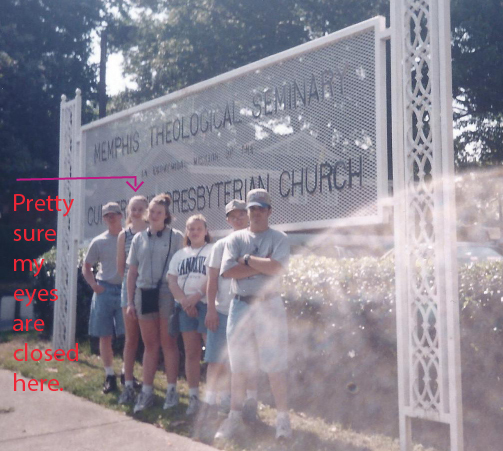 The sign still stands at Memphis Theological Seminary. It’s also kind of cool to think that two of the people in this picture (Adam Griffin, too) have taken classes at MTS. The likely photographer of this photo, Jill Carr, just graduated from here last fall. That’s some Show Me State love! Don’t send home an open-ended, 4-question, multipart Christian Ethics midterm to a writer. She will continue by spending 5+ hours writing over 4,000 words spread over nearly eight pages, use one exclamation point, include two P.S. notes, and quote the professor twice. One package of Starburst FaveReds, bought at the gas station in Union City each week where I fill up, will last me through all of my classes, and some travel. I can usually get by with just four fruit chews — one of each flavor — spread over my most desperate hour of the 3-hour class. My trip to Memphis each week in the early morning is also made possible by half a 5-Hour Energy shot. My trip back to Paducah each week is made possible by a blueberry bagel with blueberry cream cheese from Panera Bread. I’ve really been enjoying listening to non-fiction audio books through the app Overdrive and syncing through the McCracken County Public Library and Kentucky Unbound. So far I’ve read/listened to “The Boy Who Harnessed the Wind” by William Kamkwamba, and I’m working through “Brown Girl Dreaming” by Jacqueline Woodson. Makes the drive so much more fun. And I’m happy to report: No more speeding violations. Yet.